Building a home in the mountains usually requires chopping down some trees. However, the Gelotte Hommas designed Cedar Haven was not only made with recycled trees from the surrounding area, but the architects also found ingenious and inspiring ways to incorporate these trees into the home’s rustic contemporary design. Reclaimed wood is transformed into a statement design piece in this Cedar Haven room. Hoping to evoke the feel of a log cabin, while gaining the contemporary appeal of floor to ceiling windows and modern lines, the designers utilized exposed wooden beams in the cabin’s vaulted ceilings and natural wood trim on doors and windows to maintain a rustic feel. The property houses three beautiful stone fireplaces, two indoor and one outdoors, and both fireplaces and chimneys are made from reclaimed stones. Earth-toned tiled floors give the house both a stately and natural feel. The most breathtaking elements of this home’s design are the pieces of reclaimed trees that are incorporated throughout the house. Gnarled cedar trunks are used as pillars both inside and outside the home. 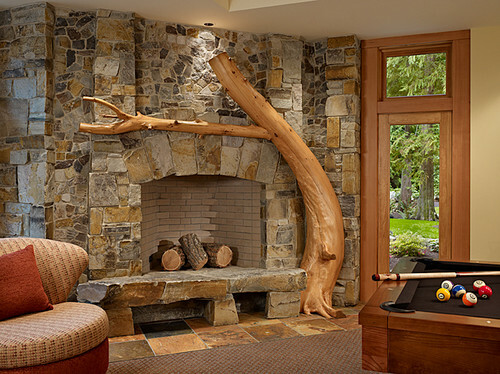 One twisted tree trunk drapes elegantly over the indoor fireplace in the rec room. Another tree stump has an entire room to itself. The curved room encircles the stump, which foregrounds a blue stained glass window and a dramatically up-lit ceiling. The vaulted ceilings and floor to ceiling windows of the main living area encourage connectivity with the outside living space and allow ample natural light into the home. If you’re interested in building a home, feel free to contact us. We are excited to help you get on your way to the home of your dreams!